"And cook them." Three little words. But for many of us - aye, there’s the rub. Hectic lives filled with multiple responsibilities, family and work commitments, and limited budgets can make cooking feel like a drudgery rather than a pleasant daily habit. And let’s be frank, who isn’t strapped for time these days? But cooking is really the fourth pillar of a lean and green diet, right after a diet brimming with whole, minimally processed foods, that features at least 3/4 plants and 1/4 high quality animal products, and with the right portions to avoid both obesity and food waste. To celebrate Mediterranean Diet Month, I’m bringing you 4 fresh seasonal pasta recipes that couldn't be easier, or more delicious and healing. I’m sharing 2 of them below, and 2 in my next blog. While one features all the best of spring farmer's markets, the other is an insanely good, omega-3 fatty acid-rich dish you can literally make from ingredients in your pantry. 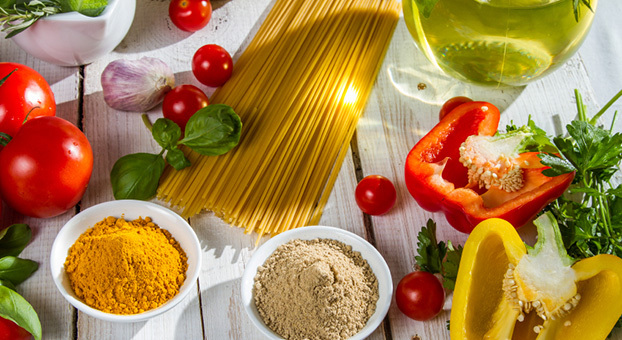 In full disclosure, I developed these pasta recipes for Barilla to help them celebrate their Double Pyramid coming to America to help consumers understand how the Mediterranean Diet is good for you and good for the planet. Let me know what you think! These are teeming with delicious, good for you ingredients, many of which are just coming into season. This is a spring fling with your farmers market! The bold, fresh flavors of spring vegetables are brought to life with lemon zest. The peas and walnuts pack added protein for staying power. PREHEAT oven to 400ºF. TOAST walnuts in oven for 5 - 8 minutes until the walnuts are lightly toasted. In a food processor, PULSE together bread crumbs, walnuts and zest from 1 lemon. POUR into a medium dish and TOSS with parsley and a pinch of salt. SET aside. PREPARE penne according to package directions. DRAIN reserving 1 cup of the cooking liquid. While pasta is cooking, POUR olive oil into a large sauté pan. ADD the leeks and asparagus, and sauté over medium heat for about 4 minutes until they start to soften. ADD the peas and the zucchini, salt and pepper, and SAUTE another 5 minutes until all of the vegetables are slightly softened. ADD zest of SECOND lemon and reserved cooking liquid and STIR gently until combined. DRAIN pasta when it’s al dente and return to cooking pot. ADD vegetables to pasta and TOSS to combine. GENTLY stir in mint and basil. Taste and adjust seasoning if needed. SERVE 1 cup pasta mixture into serving bowls. Top with 2 tablespoons of the walnut mixture. This is the ultimate quick cook meal! All of the ingredients are from the pantry, perfect to have as an on-hand/“standby” meal. The tuna adds protein and is rich in heart healthy omega 3 fats. *Sustainability in seafood depends on where you live: visit here to see which type of tuna is the best choice for you. BRING a large stockpot of water to a boil, and COOK spaghetti according to package directions. Meanwhile, in a large sauté pan, ADD olive oil, onions and red pepper flakes, sauté over medium heat until onions are softened, about 5-8 minutes. ADD garlic and sauté 1 minute more. ADD a jar of marinara sauce, capers, olives and 1/2 cup of pasta cooking water and STIR to mix well. DRAIN the pasta, and ADD to saucepan with marinara sauce. Use tongs to gently toss together until combined. SERVE by placing 1 cup of the pasta in a bowl. TOP with a couple pieces of tuna, and a handful of arugula. Looking for more Mediterranean cuisine inspiration? Check out my post, Eat Like a Roman, for other recipes, including Pasta with Roasted Cauliflower, Lentils and Fresh Herbs, and more!